Today we are discussing about watermelon, alot of foods and fruits are relatively fun to munch and I tell you that watermelon is definitely one. Watermelon is a colourful fruit that has heavenly sweet juice inside of it. It has so many nutrients that we can derive from it while consuming it, and has alot of water[92%] to keep us hydrated, likewise it is a low fat fruit. 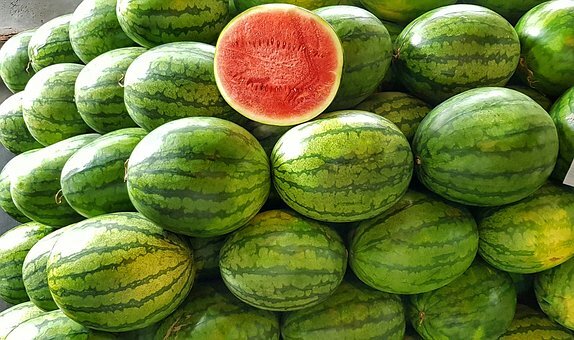 ■Watermelons are rich with so many vitamins, the vitamin A found in watermelon has anti-oxidant and helps to maintain our sight [eye]. The vitamin C streghtens our immunity, prevents cell damage, promote healthy teeth and gums, and heal injuries. The vitamin B6 in watermelon helps our body to convert protein to energy and also helps with the brain functions. The best way to eat watermelon is eating the red meaty found inside the fruit in order to enjoy and benefit from its rich nutrients. You can as well consume it in fruit salads, smoothies, or by juicing it. Watermelon is a summer fruit, which help us stay hydrated. Healthy eating is very important and essential for our body. In addition, other harmful ingredients such as preservatives and trans fats make these foods even more damaging to the human body. Some of the most unhealthy foods in the world include high-sugar cereals, sugary coffee drinks, canned soup, margarine, soda, processed lunch meats, ice cream and frozen french fries. Always prefer the best for your body. Hello Blake, you are so on point. Thanks for your input.